Over millennia many have believed gods live atop volcanoes. Some cycling fans may perpetuate this given the amount of star riders who spend their time living on top of El Teide and Mount Etna. It’s becoming normal these days for riders to spend weeks at altitude before racing once and returning to altitude again. For several reasons this week’s Tour de Romandie has become a rare meeting point for many grand tour contenders. Chris Froome, Geraint Thomas, Nairo Quintana, Tejay van Garderen, Richie Porte, Simon Špilak, Ilnur Zakarin, Thibaut Pinot, Romain Bardet, Miguel Angel Lopez, Mathias Frank, Rui Costa, Tom Dumoulin, Rafał Majka… that’s just a few of the names in contention. With this in mind a quick look at the route and contenders. Why Romandie? It’s a compact race that offers everything needed to test the legs of Tour de France hopefuls with summit finishes and time trials alike. The calendar slot suits too allowing those coming from the Ardennes to meet a few on their way to the Giro as well as those riders showing up for their monthly race effort. La Chaux des Fonds is the perfect place for the prologue being a capital of the Swiss watch industry. The town is famous for its long rectilinear streets but the course includes some twists and turns as it climbs up towards Le Corbusier’s house. Forecast finish time: 5.45pm. Stage 1 is for the sprinters but the profile will make some wince as it heads for the finish in Moudon and then out for a loop above the town across a hilly plateau where the road is regularly climbing at 5-7% before a steep drop back into the finish. Forecast finish time: 5.10pm. 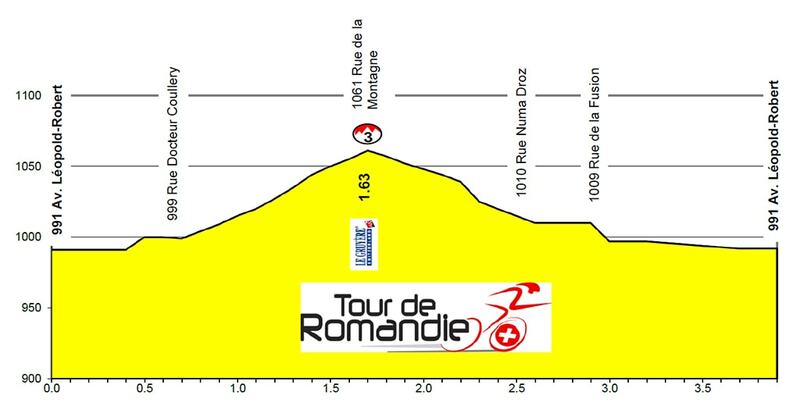 Stage 2 sees the race head for the mountains with a summit finish next to the French border. The profile above has a bit of y-axis doping making the final climbs look vertiginous when they’re steadier climbs that often feature when the race visits, typically 6-7% but there are steeper moments. For the record Chris Froome should know these roads given he lived nearby when at the UCI’s World Cycling Centre and FDJ have locals Morabito and Reichenbach to fill in Thibaut Pinot. Forecast finish time: 5.10pm. 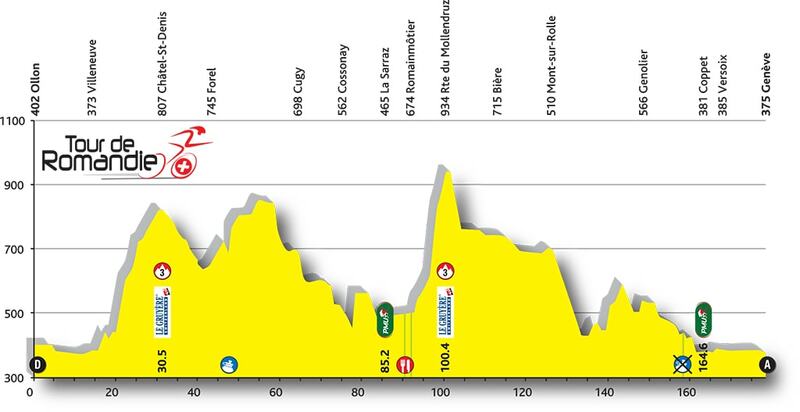 Stage 3 is a 15.1km time trial featuring a spiky climb mid-way with some 8% sections and a brief “wall” make this a day for the grand tour contenders rather than the time trial specialists. Forecast finish time: 5.45pm. Stage 4 is the Queen stage with the climb to Villars tackled twice. On the way is the Col des Planches, 10km at 9% which will start to sap the riders. After the feedzone in the valley they head for the Col de la Croix although turning off before the top to descend to the valley and then repeat the climb again. It’s steepest at the start before easing off, the slope on the profile between Barboleusaz and Villars-sur-Ollon suggests it’s steep to the line but in reality it’s just a drag to the point where a small railway runs parallel to the road. A total of 3311m vertical metres make this a day for the climbers but it’s not savage, riders will be relatively fresh for the finish. Forecast finish time: 5.10pm. Two summit finishes with time bonuses (10-6-4 seconds) and two hilly time trials mean a course for an all rounder. The mountains are hard but not as difficult as the profiles suggest. The rider who takes the lead in the time trial can use their team to defend. Chris Froome is the reputation pick, ideally suited to the course and twice a winner of the race. But is the form there? He’s not racing much, a win in the Herald Sun Tour for his employers and then eighth overall in the Volta Catalunya. It’ll be interesting to see him in the time trials, he dropped this to mirror the Tour de France’s lack of TTs and now it’s back for July we’ll see if he’s back to winning ways. After his classics interlude Geraint Thomas can now resume stage racing and we’ll see how he fares alongside Chris Froome. Michał Kwiatkowski could surprise in the prologue too. Katusha return with their double act led by last year’s winner Ilnur Zakarin and previous winner Simon Špilak ex post following Valverde’s disqualification). Zakarin’s coming into form as his fifth place in Liège-Bastogne-Liège but his big goal is the Giro so he may back off here and leave it the Iceman Špilak who seems to specialise in wet week long stage races. A new tandem for 2016 is Tejay van Garderen and Richie Porte. A year ago Porte was the world’s number one ranked rider after winning a series of stage races and ready to race for the Giro but has has a more discreet start to the year collecting podium places rather than the top step. Van Garderen’s still searching for that big stage race win, he’s never won a stage race in Europe so far but will likely feature. Of the two Porte’s punchier style could be more suited to a race with time bonuses and as much as the pair talk of harmony one has to be better than the other. Either way BMC will hope for a result in their home race. Nairo Quintana is another who races infrequently but 2016 has gone well for him with a win in the Volta Catalunya and third in the Basque Country. The Colombian will relish the contest with Chris Froome and the course suits him perfectly and if he might prefer even more altitude even he’d say no given the dire weather forecast for the rest of the week. Movistar bring a very strong team, look to see how Andrey Amador is climbing ahead of the Giro. 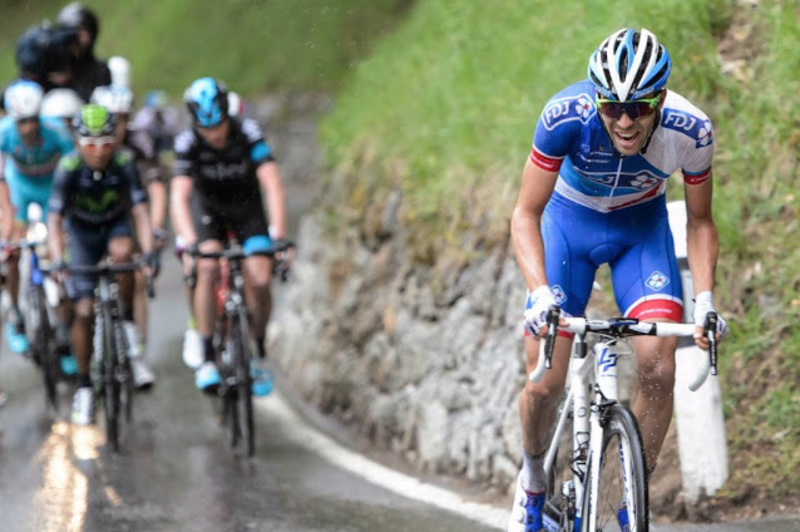 Thibaut Pinot loves this race, it’s where he emerged as a neo pro by taking the mountains jersey aged 19 and he won the Queen Stage last year. The bad weather suits him too and he’s improving in the time trials. The only question is his form, he’s been simmering for a while now and could dry up but Romandie has always been a big goal. He just missed a podium in the Basque Country where the steep slopes suited him less. He comes with a strong backing from FDJ including locals Steve Morabito and Seb Reichenbach. Rafał Majka took a tumble on the way to Liège but he’s ok as he preps for the Giro. Like others he’ll use this race to test himself but could well hold back. So expect measured efforts along the way but maybe moments where he eases up too. After the Vuelta Tom Dumoulin could be a contender for the overall win but is he back into time trial mode? If he is then there are two stages for the taking here as he preps for the Giro’s Dutch departure. Rui Costa leads for Lampre and could do a solid ride here as his recent form has been impressive but could find there’s a touch too much climbing here for him. Davide Cimolai took the team’s first win of the year with a sprint and could strike again. Miguel Angel Lopez is Astana’s joint leader, the second year pro gets his chance while Fabio Aru sits this one out and Vincenzo Nibali saves himself for the Giro. Luis Leon Sanchez may target GC but is often better an opportunist picking off stages with his descending skills. As ever Astana come with a stacked team. Romain Bardet‘s consistent this year with his worst GC performance being ninth in Paris-Nice but he says he wants to win something this time which suggests trading GC security for a stage win. He has been training at altitude for this race. Trentino – sixth overall – was really the end of his training block so expect attacks in the mountains. Pierre Latour is worth watching while Samuel Dumoulin is in form and has a chance in the two sprint stages. Cannondale come with a strong team on paper. Rigoberto Uran is getting ready for the Giro and in past years has been solid but no more in Romandie. Pierre Rolland wants to show what he can do, Davide Formolo has big talent while Andrew Talansky has been able to ride in the front group in the past but has not won a road race since his triumph in the 2014 Dauphiné. Bauke Mollema leads for Trek-Segafredo and he’s yet to flourish for his new team, a steady rider who gets plenty of solid results in the top-10 but rarely wins. Jack Bobridge is a curiosity for the prologue and Niccolo Bonifazio is the sprint choice. Wilco Kelderman leads Lotto-Jumbo and should turn in another consistent performance with Jos Van Emden one of the rare prologue specialists in the peloton today. Local team IAM Cycling have Mathias Frank and Jérôme Coppel to get in the top-10. Marcel Kittel rides for Etixx-Quickstep and will hope he can stay in the race all week in order to make the Geneva stage with its pan flat sprint finish. Finally Michael Albasini took two stages last year and three the year before that and is obviously in form right now and he’ll have marked Stage 1. Weather: cold and wet for much of the race. It might be spring but Romandie has either bad luck and it rains a lot in this slot or there’s a damp micro-climate, either way recent editions have often been cold and damp. TV: excited about the race? Now for the bad news as it’s hard to watch on TV. The race website has a list of countries for you to look up and there’s always cyclingfans, cyclinghub and steephill too. Note the varying finish times for each stage listed above, all in CET, aka Euro time. For those in the UK race highlights are being shown on the ‘Bike’ channel. Listed as ‘Live’ but obviously can’t be at the 7pm time it is down for. Looks to be live a 3pm each day according to the website this morning. It’s a new channel on Sky and Virgin Media see http://www.bikechannel.co.uk/programmes/398/ it’s not on Freeview (yet). …but, just to be clear because I wondered some weeks ago, it is a non-subscription channel – i.e. if you have a basic Sky package it’s included for “free”. On Sky it’s channel 464. Find it pretty hard to be excited by this race. After the classics, it’s always a bit mundane. Back to stage racing and watching teams ride in the train until their top rider is left. OTOH, in recent years we’ve seen A LOT of stages in GTs (and short stage races, too) being raced aggresively like you’d expect from one-day Classics – and among the finest of them, both hilly and cobbled. Agreed. Was it romandie last year, or the year before that Talansky won? Cracking race whichever edition it was, and Paris Nice this year (and last year from memory) were very good. Correction – I’m thinking of the 2014 Dauphine! I suppose it’s just my own personal bias. I see these shorter stage races as ‘warm-ups’, either for the grand tours or the classics. Therefore, I care less who wins overall, so I’m less excited. There have been a few interesting stages within them, but there is an awful lot of mundane racing (this year’s Tour of Catalunya, for instance – yeesh) – and that seems to happen more often. Would’ve thought that Kwiatkowski was due a rest – certainly based on his Ardennes form. How was he so rotten in the Ardennes and yet winning E3 and coming 3rd in this prologue? A prologue is a sub-10 minute effort. I’m not at all surprised he was good here, he’s had great form this year, and a prologue doesn’t test your stamina nearly as much as any of the Ardennes. At the same time, he’s been racing full-on with very good form since mid-late March, so I’m not surprised at all that he had difficulty after Paris-Roubaix in 200-250km races. There’s a reason why most Cobbled Classic leaders don’t often do the Ardennes, and there’s a reason why the Ardennes leaders are not in peak form at the Cobbled Classics. Part of that is the specific characteristics of each, but also part of that is you can’t peak for 2-months. Good points: I’m one of the many who have been saying for a few years ‘Why does nobody do all the classics?’ Kwiatkowski has maybe shown us why not. Yeah, exactly. He was even flying at San Remo. I think his chances are higher than some might imagine. The climbs are not as bad as the Giro, it’s not 10km of 9%, more like 8-9% for a kilometre and then things even off, if Dumoulin can stay with the riders on the steep part of the climb – BIG if – then he’s got a chance at sprinting for the stage win from a small group in the flatter-than-people-think stage finish. The exception to this of course is the Col des Planches, which is 10km of 9%. Having ridden it, I can say that it’s worse than that. It’s quite uneven, with lots of little walls. The steepest bit is over 16%, and there is one full km of 12%. That being said, it is safely far from the stage finish so I suppose it won’t make too much of a difference. Yes, but he’s also going for the Giro overall GC so he’s not entirely bulked back up to TT mode, he’s a bit in between, with the Rio course not entirely flat either. That said he’s not shown any great form so far, bad season. Seems from the profiles that Michael Albasini will probably only win two stages this year. That’ll be hard, a lot of riders will find the final stage is open to them. Looking at the start list there’s a few quick men (Kittel, Swift Hofland, Navardauskis etc) and plenty who are handy on the climbs, but as Alba has proved before, he’s pretty tough to beat on home roads in a race he focuses on. Plus his form out of the Ardennes suggests he up for a win. Spilak was 1’25” behind Quintana in the Pais Vasco TT, so it’s difficult to see him over coming that kind of deficit here, unless the weather is really awful perhaps. The Basque TT was really unusual and maybe Špilak wasn’t racing it 100%? Of course you could be right and he’s in bad shape too. You mention that Spilak won in 2014. I thought Froome won in 2013 & 14? I wonder if Sky won’t be hedging their bets in this race, and seeing where G and Froome end up after the TT. Ah, I see now that you meant Spilak was a winner in the past, rather than the year before Zakarin. I didn’t see the prologue but the results look quite unusual. Was changing weather a big factor? How come good time trialists with GC aspirations like Froome and Uran are so far back? ‘Rolland wins 3 seconds over Froome in prologue’ would have made a good April fool’s joke four weeks back. It seems that the ones who did well were those who carried good form out of the Ardennes, and a limited selection of TT’ers like Dumoulin, Kwiatkowski and Thomas. Yes, the last riders had more difficult weather conditions and favored caution on wet roads. The first and last riders had it worst but some seemed to be taking it carefully. Wilco Kelderman fell which explains his bad time and perhaps some riders just don’t cope with the criterium style prologue with its corners in any conditions. Biggest surprise of the day was Andrew Talansky who was over minute down without explanation. The riders on podium started all in same last half’n hour as some favourites. Some just take more risk in the tricky cornered descent than others, but all had wet roads. A thing that is, for instance, not really Froome’s strength. Watching Ion taking that corners and Froome was different as night and day. Loosing 26s on such short distance is massive. Other GC riders did much better. And Izagirre and Dumoulin can be GC aspirants as well.